Kindness is a constant it seems. Whereas brave, grace and other things we’ve looked at can sometimes only come into effect on certain occasions. Possibly several times a day. But kindness is something that I think we can be doing all the time; whether its being kind to ourselves-losing the negative self talk and replacing it with kind words to ourselves-or in an email, a text, a chat with the cashier or with your cousin, every single interaction we have with ourselves and the world can benefit from kindness. 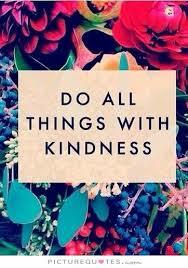 The word kindness feels like an amazing patchwork quilt that can tuck over any anger or frustration. How can I be kinder in this situation? How can I throw a quilt over the flames?